Neodymium magnets are brittle; they can be broken or can splinter in a collision. One should wear gloves and protective glasses when handling these magnets, because splinters could disengage and fly from the magnets. Pace-makers may be damaged or switch to "Test Mode" in the presence of a strong magnetic force, if a pace-maker is in use, keep a minimum of 3 feet distance. Children and pets should not be allowed to handle neodymium magnets as they can be dangerous. Small magnets pose a choking hazard and should never be swallowed or inserted into any part of the body. Rare earth magnets are the strongest type of permanent magnet currently made. They are amazingly powerful for their size and have innumerable uses. These block magnets are 1.2 inch (30mm) long, 0.6 inch (15mm) wide and 0.2 inch (5mm) thick. They are magnetized through the thickness. They are composed of neodymium iron boron magnetic material and are plated in nickel-copper-nickel for a shiny corrosion resistant finish. Maximum working temperature is 176 F (80 C). DIY PROJECTS & SCIENCE EXPERIMENTS - Refrigerator Magnets, Shower Door, Work or Office, Scientific Purposes, Arts and Crafts or School Classroom. Applications include: Magnetic holding, mounting, home improvement, DIY projects such as a tool holder, and many more. A popular use for these magnets is as cabinet door or shower door catchers. 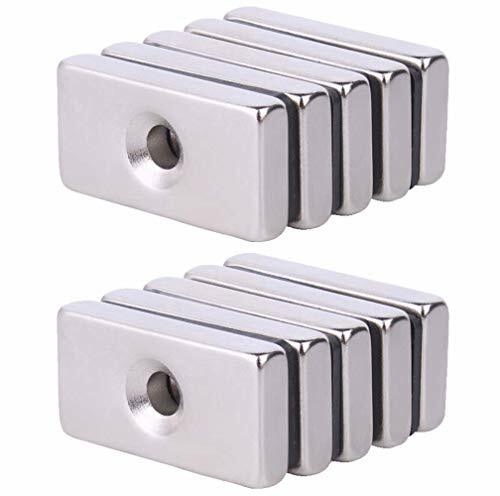 These long-lasting, corrosion resistant new magnets are made from Brushed nickel silver finishing material. One magnet can hold up to 12 papers. If you have any questions about this product by ZHW, contact us by completing and submitting the form below. If you are looking for a specif part number, please include it with your message.